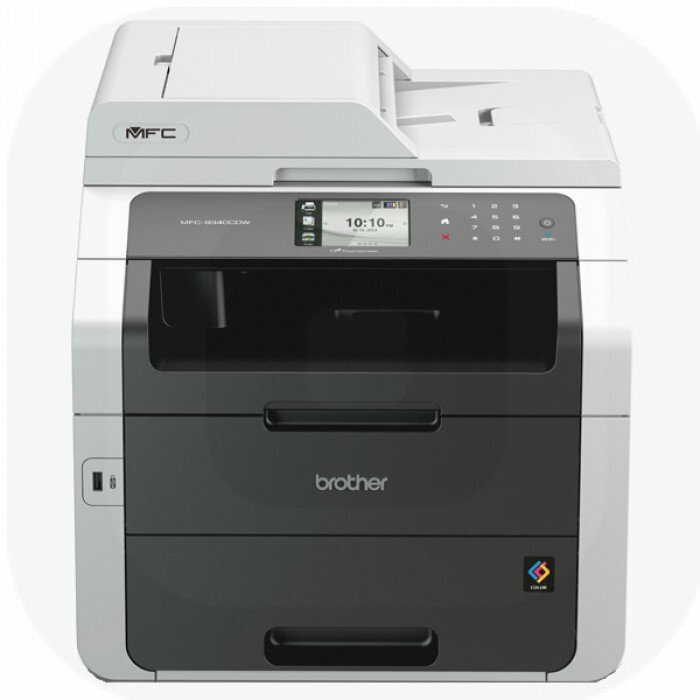 The Brother MFC-9340CDW laser printer is included in Brother's LED colour range, which uses advanced printing technology, including several mobile features. This digital printer combines four machines in one, as the Brother MFC-9340CDW packs in a printer, copier, scanner, and fax machine in its compact body. It supports duplex printing, scanning, and faxing, and it supports wireless printing. However, the unit does not offer an expandable memory and it has limited media capacity. The Brother MFC-9340CDW colour laser printer is sleek and compact, measuring only 16.1x19x16.1 inches. It has a 250-sheet input capacity and a single-sheet multipurpose tray for thicker media. The device supports duplex printing and it has flexible connectivity, featuring a USB direct interface, Ethernet, high-speed USB and wireless connectivity. The Brother MFC-9340CDW has a standard memory capacity of up to 256MB and it supports various Windows and Mac operating systems. In addition to its multifunction features, the Brother MFC-9340CDW printer offers many other selling points, including its mobile device compatibility and wireless capabilities, decent print speeds, and impressive duty cycle. The device supports up to 30,000 prints per month, and it can produce as many as 23 black or colour pages per minute. The device also supports black and white faxing at 33.6 kbps, colour copying and advanced scanning. On the other hand, the Brother MFC-9340CDW does not have expandable memory and paper capacity, which limits productivity. Nevertheless, the unit is a good choice for workgroups and even for personal use, offering maximum print resolutions up to 600x2400 dpi.